NASA'sJames Webb Space Telescope is getting a broadband upgrade with "SpaceWire"that will allow the new orbital observatory to capture images of the universe inunprecedented detail once it launches in 2013. Engineersat the NASA Goddard Space Flight Center in Greenbelt, Maryland, took SpaceWire,originally developed by the European Space Agency, and adapted it for easierimplementation on space missions. They designed a small, low power microchipthat can send SpaceWire signals at speeds over 200 megabits per second, or overten times faster than most high definition television broadcasts. The boostin speed makes information processing faster among the James Webb SpaceTelescope's (JWST) four science instruments as they "talk" to eachother with the SpaceWire network. That means the infrared telescope, NASA's next greatobservatory, should capture larger and higher resolution images of space. 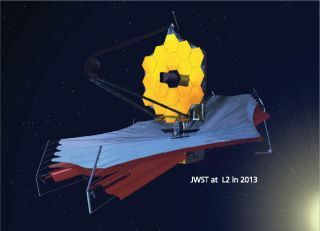 "Itmakes the scientists happy, and makes the observatory more efficient because itcan cover a large swath of sky faster," said Pam Sullivan, manager of theJWST Integrated Science Instrument Module. She called $4.5-billion JWST"the nextgeneration space telescope" and "successor to Hubble" that will look back 13billion years to understand the origins of the universe. "Thetrend is for telescopes to have more and more detector pixels to take biggerpictures of sky," observed Sullivan. She added that SpaceWire enableslarger telescopes because "more pixels generate more data, and you have tohave way to move more data around." Future missionscan use SpaceWire technology as a standard high-speed electronics package,rather than having to custom-build each time. After Goddard developed itsversion of SpaceWire for the JWST, the improved technology became available forother NASA missions such as the Lunar Reconnaissance Orbiter and theGeostationary Operational Environmental Satellite-R.
Nearlyevery major U.S. aerospace company, such as NorthropGrumman and Lockheed, has received Goddard's version of SpaceWire forgovernment projects, and will soon be able to use the technology in commercialapplications. NASA centers that currently use SpaceWire in technologydevelopment include the NASA Glenn Research Center, in Cleveland, OH, the JetPropulsion Laboratory in Pasadena, CA, Langley Research Center in Hampton, VA.,and the Marshall Space Flight Center in Huntsville, AL. For now, theJames Webb Space Telescope represents the next step for NASA – and itscollaborators from the European Space Agency and the Canadian Space Agency – totake advantage of SpaceWire. Because of the exceptionally large number ofdetector pixels, the collecting area of the telescope exceeds the width of therocket carrying it into space in 2013. The telescope will be folded up duringlaunch and fully deployed to its 21-foot (6.5-meter) width once in orbit, anextra step well worth the effort for NASA managers. "Tosee all the way to the edge of the universe, youneed larger telescopes," said Sullivan.